A man named Joe taught me to sail aboard this boat. 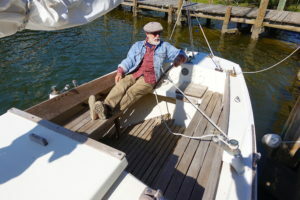 His favorite position at the tiller was just like this–kicked-back and chillin’ easy aboard his Easy Lady. So, here’s a cool follow-up to a story I wrote called A Boat to See Me Home that was published in Garden & Gun magazine. I hope you’ll read the piece, but the short of the long is this: Forty years ago I learned to sail aboard a boat named the Easy Lady, whose captain, Joe, was my mentor and became a dear friend of mine. 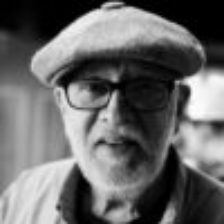 When Joe died without close family, his unclaimed boat wound up in an automobile wrecking yard, of all places. By surprise, I found it there twenty years later while looking for spare parts to restore an Austin-Healey Sprite, and bought the boat, spent six months restoring it, launched it, sailed it, and sold it to a man down at Pirate’s Cove, Alabama, where I had her docked. Bobby thanked me for not going sailing and hanging out with him on the beach. A few weeks ago, I got an email from Tommy, the new owner of the Easy Lady, a professor at Columbia University and the adult son of the man who bought her from me. He tracked me down after his surprise to read the background of his dad’s boat in a Garden & Gun article. Like, wow, here’s this story about my boat! And last Thursday, my little dog Bobby and I went to Pirate’s Cove and met Tommy and his son. Bobby didn’t want to go sailing, so that’ll be for another time soon, after Bobby takes a few sailing lessons from me. But it was an emotional moment for me to sit in the cockpit of the Easy Lady again. And also to enjoy immediate rapport with her new captain, found that I liked Tommy’s easy manner and his quick mind. 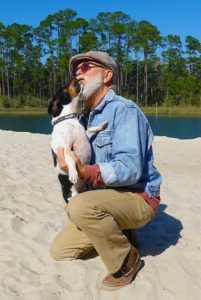 Bobby and Tommy also hit it off, and I just got an emailed photo from him of my pup and me there on the beach. My original boat registration from 6/30/99. 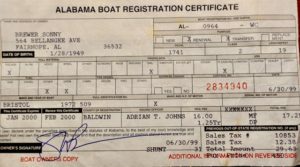 And, if you read my last post here, the thing about 9s and digital roots, and stuff, may I tell you that my original boat registration form had this typed-in date: 6/30/99. The digital root of that sequence is a 9. I love it. I’ve got not a single clue where the rest of this story will go, but I am certain it will be a good one, Bobby will be a main character, and a tale that I’ll be pleased to share here on this Over the Transom page. Yes…No… Looking forward to next. What pleasure aboard the Easy Lady recalling friends past with new! As a former sailboat owner/live-aboard, I LOVE this story and can’t wait to see where this goes. Perhaps, just perhaps, this little lady might share that very special place in my heart/mind/favorite-stories with our beloved Henry Stuart! Do tell us this sailboat story. Awaiting! I’m letting it simmer, Kitty. Still in the noodling phase, but maybe soon I’ll put down some words. Thanks for your thoughts.